Whether you’re a seasoned paleo foodie, a chronic dieter or a newcomer to the world of clean eating, there’s a good chance that you’ve struggled at one point or another with how to stick to your program in social situations. Going out to a restaurant or a party can be pure torture (read: relatively inconvenient) for those enduring any kind of elimination diet or simply trying to eat healthier, especially when the people you go out with are ordering all the unhealthy foods you still crave. Luckily, there are ways to make your social life a whole lot easier to maintain while still making your health a priority. Here are a few tips to get you started! “But what will I eat at Tiffany’s?” Holly asked herself, wondering if she could find a menu of their breakfast options online. Research the menus ahead of time. Your friend calls you up and says, “We’re going to that trendy new restaurant downtown tonight. They serve cupcakes in champagne glasses for dessert so bring your appetite.” You immediately jump into a panic because: (a) Cupcakes sound amazing right now but you’re trying to kick your sugar habit. (b) You aren’t really sure what you’ll be able to eat because you’ve never been there. (c) Parking is horrible downtown, especially on a Saturday night. Luckily, there’s an easy solution to problems A and B: go online and look up the restaurant’s menu online! As both a picky eater and someone who has completed a few rounds of Whole30, I do this all the time before going to a new restaurant. If I can make a decision before I leave the house, I am less likely to order a bucket of tater tots in a fit of hunger and panic. Knowing what you’re going to order beforehand takes away most of the pressure you may be feeling, so that instead you can focus your energy on finding the right parking garage. Planning ahead is key to your success! Know your staples and substitutions. Most of the time, I know I am safest ordering a salad or some combination of grilled chicken and veggies, and I am totally fine with it! Have an idea of what works for you before perusing the menu, and don’t be afraid to make substitutions. I am constantly replacing rice with veggies or asking for the sauce/dressing on the side, and most places are ok with these changes to an extent. I even keep a running list of my favorite healthy options and substitutions at local chain restaurants that allow me to stick to my program if I go out for the night. Sabrina didn’t have the heart to tell Linus that alcohol wasn’t permitted on the Whole30. If you decide to go out with friends, pick the restaurant. No more of this back-and-forth “I don’t know, where do you want to eat?” that seems to land you at the Olive Garden every time. (Mmmmm, endless breadsticks.) I have a few friends who are kind enough to ask me if I’m on Whole30 before we go out, but there are plenty of times I’ll take charge on a restaurant choice because I already know there won’t be anything compliant for me at other restaurants. Don’t be afraid to speak up and make the decision yourself! Bring food to the party. I’m guilty of snacking at parties. No matter how many people are present, there always seems to be more than enough food to nosh on between conversations and awkward one-armed hugs. I have never been to a single party where healthy food outnumbered the junk food (although one can only dream of a secret paleo society that hosts monthly parties featuring sweet potato gnocchi and cauliflower poppers). To keep yourself from gravitating toward the Cheetos, bring a healthy snack that people will enjoy and fits your own program. There are about a million ways to make a fun fruit salad, or if you are on a less restrictive program, you can always opt for healthier versions of your favorite junk food (Skinny Pop Popcorn and The Better Chip spinach/kale chips are two of my favorites). Besides, bringing food to a party is the proper thing to do! Ann didn’t want to spend her entire Roman holiday focused on food, so she and Joe hopped on a Vespa to cruise around the city instead. Focus your activities on something other than food. Fun fact: Not every social activity needs to involve a meal. If you find it difficult to stick to your program while out in a restaurant (because, let’s face it, this is no easy feat), stop going out to restaurants. Invite your friends to go bowling or visit an art festival. Watch a movie in the park. Find a museum in the area that you’ve never been to before. Have fun without bonding over how much you’ll hate yourselves for ordering the mozzarella sticks. In general, a lot of experts suggest avoiding the scale (or cutting back on its use) regardless of your social life, but my tip in particular focuses on restaurant visits. Most restaurants will pack your food with tons of salt, so if you’re planning a weigh-in any time soon, you may want to wait. “Do I look like I care what you think?” Jo asked, posing fabulously with the Nike of Samothrace. Stop caring about what others think. When you change your lifestyle, especially when that leads to dietary restrictions, there will be naysayers. Don’t listen to them. Remember that different food groups and chemicals affect everyone differently. I would love to lose weight while eating endless bowls of pasta and laughing in the faces of my enemies, who have gained weight eating that same pasta, I know this is not possible for me. I know how gluten affects my skin, mood and stomach, so when people comment that I should be eating “whole grains” and “in moderation,” I’ll smile, thank them for their suggestions, and keep doing what I’ve been doing. You know what works for you better than anyone else does (except your doctor, of course), so if your friends start giving you unwarranted dietary advice, ignore them or change the subject. What are your tips for maintaining a social life while still eating healthy? Sound off in the comments section below! Embarking on a new diet or wellness program can often be challenging. As you attempt to eliminate those “problem foods” or to introduce new super foods to your lifestyle, you may not know where to begin! Those regular staples you once fell back on are now out of the picture, and you might find yourself struggling to figure out what to eat or how best to stock your kitchen. Meal planning can be a simple and effective answer to the overwhelming questions, “What groceries should I buy and what should I make for dinner tonight?” No matter what your dietary preferences or limitations may be, a meal plan is a great way to prepare yourself for the week ahead and to avoid wasting food! I’ve created a meal planning template of my own that I use regularly, and I find it extremely useful to incorporate into my busy schedule. Click here to download my meal plan template as a Microsoft Excel file that you can edit, or click here to download the PDF version to print. Having a meal plan keeps me on track and helps me avoid going to Publix four times in one week (as much as I love grocery shopping). It also allows me to turn my “hey-I-saw-this-on-Pinterest-and-I-want-to-make-it” dreams into a reality because I know which ingredients to purchase ahead of time. Think about what you will be doing that week. In my event-driven job, I am constantly working during meal times and often exposed to delicious but unhealthy free foods. (I’m thinking of you, pizza!) When I think about my schedule when meal planning, I can determine when I will need to pack a lunch that will keep me away from the pizza box, or (if I know I’ll be working late), I can decide ahead of time to pack a snack to tide me over until I get home. On my personal downloadable meal plan, you can actually fill in your daily activities and add notes for these days. Think critically about meal prep. On my meal plan, I like to include certain tasks, such as “defrost chicken” or “hard-boil eggs,” to ensure that these foods are ready by the time I am ready for them. I may also incorporate my weekly schedule by adding the reminder to “pack lunch for tomorrow.” These “meal prep tasks for the next day” are the perfect way to make sure your ingredients are ready to go. Consider packaging and portion sizes. Buying a fresh head of broccoli? Think about how many servings you will make with that, and implement those into your plan. For example, if a package of cauliflower florets yields two individual recipes with cauliflower, you should include two cauliflower meals on your meal plan so that your produce doesn’t go bad. Keep staples on hand. If you know that you regularly use a certain ingredient, such as almond flour or coconut oil, always make sure you are fully stocked. It’s always disappointing when you are dying to try a new recipe but have to run to the store at the last minute to pick up a basic ingredient. Always check your cupboards before shopping. Once again, you can download my weekly meal planner template as an Excel file here or as a PDF here. For recipe inspiration, check out my Pinterest boards! What are your weekly meal plan tips? Share yours in the comments section below! Ahhhh, college weight gain. It’s the reason the term “Freshman 15,” which I’ve borrowed for my blog’s college advice series, even exists at all! Although the Freshman 15 is a popular subject (and fear!) among college students, I have avoided writing about it in the past because of my personal struggles with weight and body image. My weight fluctuated in college, and crept up on the scale in the months following my graduation. Much like college, my job is very event focused, and I found myself making some unhealthy food decisions based on convenience and stress. However, in February 2014, I decided to make a huge change, adopting a much cleaner diet and dropping nearly 20 pounds in the process. My journey to better health is ongoing (and I could probably write an entire book about it! ), but I’ve learned a lot of important lessons along the way that will benefit any college student – or graduate – looking to avoid that dreaded weight gain. 1. Even if it’s free, you don’t have to eat it. Free food is abundant in a college environment, and it’s the perfect way to draw students in to events on campus. As a college student, I was a sucker for free pizza. Even worse, I consumed tons of free pizza as a college grad because I worked at a lot of university events and pizza was always available. Over time, I learned that free food was NOT always the best option for my waistline! Now, when I know I’m going to be surrounded by unhealthy free foods, I’ll try to eat something beforehand to curb temptations, or I’ll bring along a healthy snack. If you are going to indulge, stick to one slice. 2. Don’t drink your calories. Alcohol is filled with hidden calories! We often think about foods being high in calories, but it’s easy to forget that our beverages can be, too. (Personally, if I were allotted 500 calories and could choose between alcohol and chocolate cake, I would always choose the chocolate cake, but that’s just me.) It’s okay to order a drink once in a while, but be wary of how much you consume! Opt for water or make your drinks skinny to trim back some of the calories. 3. Prepare meals at home. Not only are you saving money by eating at home, but you are also more likely to cut your calories and avoid many of the unhealthy hidden ingredients found in restaurant food. While many menus do have some “lighter fare” options, you still don’t always know how much sodium or what quality ingredients are used in your meal. When you cook at home, you are the one in control! Unless your college campus is spread widely throughout the city, walking to classes can be the perfect way to burn calories throughout the day and sneak in some exercise. My university has horrible parking problems, so walking instead of driving between classes was actually faster for me and a good way to save on gas. If you don’t like to walk, consider riding your bike or skateboard instead! 5. Make it work in the dorms. A full kitchen is ideal for meal preparation, but even if you live in the dorms, you can still live a healthy lifestyle. Look for easy, healthy recipes you can prepare in the microwave or store in your mini-fridge. You may not be able to create gourmet dinners you’re comfortable posting on Instagram, but you can still manage some simple meals using the bare minimum. 6. Bring healthy alternatives to parties. 7. Find coupons to buy healthy foods at a lower price. Since I started eating more produce and keeping certain specialty items in the house for healthy cooking, I’ve noticed my grocery bills have gone up. (I’ve also noticed my restaurant bills have gone down… but I digress.) Look out for coupons at your local grocery store and buy in bulk when possible. Generic brands are usually fine as long as you check your ingredients, and organic doesn’t always make a difference when it comes to certain fruits and veggies. You don’t have to break the bank when shopping for healthier foods, but keep in mind that even when you do spend a little more, you are investing in a healthier future. When I began my first Whole 30, I was amazed to see how many unhealthy (and unnecessary) ingredients were hidden away in many of the foods I commonly bought. In fact, I had to go to a specialty store to buy pickles that didn’t have food dye OR sugar/corn syrup in them! Did you know that many tomato sauces and chicken broths also have sugar in them? As someone who tries to avoid added sugar, I am still amazed at how hard it is to find foods without these sweeteners in them. Keep in mind that “low-calorie” doesn’t always mean “healthy,” and try to purchase foods with better ingredients in them as often as you can. 9. Find convenient snack and meal options. Let’s face it – for many of us, preparing clean and beautiful dishes for every meal can be a little unrealistic. When balancing coursework, a job, extra-curricular activities and a social life, there just aren’t enough hours in the day to always have the perfect dinner on-hand. However, this is not an excuse to eat TV dinners and run to the vending machines between classes! Figure out what you can eat when you’re in a major hurry or just too tired to cook. For me, this means stocking up on fruit, carrots and Lara Bars that are perfect for my grab-and-go lifestyle. I also like to hard boil a few eggs at a time and have them ready in my fridge when I need a quick protein-filled fix. Meal replacement shakes can also be a good way to go! 10. Figure out your healthiest options on campus. Does your college have a dining hall or food court? Do your research and figure out what meals you can enjoy without sabotaging yourself. The university where I often work has a well-stocked salad bar, which can be a great option when I don’t feel like packing a meal that day. Are you a sandwich enthusiast? Swap out your usual fried chicken for grilled, and consider doing away with the bread altogether! Craving a burrito? Make it a burrito bowl. You can make small changes to cut back while still enjoying the same tastes you love. 11. Participate in more active social activities. You don’t have to live at the gym in order to live an active lifestyle. Instead of letting all social activities revolve around food and drinks, consider going for a walk around a new area of town with your friends, or hike in a place you’ve never been before. Go to the beach. Spend the day mini-golfing. Go to a group exercise class together. Power walk around your mall before the stores open, and then go shopping. (Mall Walking: It’s not just for old ladies anymore!) You don’t have to sweat or do anything particularly strenuous, but find ways to get out and move around while still enjoying your friends’ company. 12. Don’t eat late at night. Nothing good ever happens after 2 a.m. Even after 9 p.m., I’ve noticed that food choices tend to become a lot less healthy the later it gets. Pick a cut-off time to stop eating, and stick to it! This will help you skip the late night snacking that plagues so many of us throughout the college years and beyond. 13. Out of kitchen, out of mind. 14. Build your support system. Find friends who will be a good influence on you! Ignore the naysayers – they will be out there. When I decided to change my diet for good, I did receive some negative comments from friends and acquaintances, and chances are, you will too. Don’t listen to them. You need to do what is best for you and your health, so spend time with people who also live a healthy lifestyle and are not looking to sabotage yours. For me, diets just don’t work. I have severely cut back on calories and tested out fad diets, and ultimately I learned nothing from the experience and wound up gaining the weight back. This time around, I completed two rounds of the Whole 30, an elimination program designed to help you discover food sensitivities and improve your overall health. Once this was over, I learned that my body hates gluten, sugar gives me headaches and super-processed junk food makes me cranky! (Yes, food really can affect you in more ways than just your weight.) Through this program, I lost a lot of weight and kept it off because I created a lot of new habits and began a lifestyle of about 80/20 clean eating. You can’t just change your food choices temporarily – you have to develop healthy habits if you want to achieve lasting results! Readers, have you struggled with college weight gain? What are you doing to combat that? What other topics would you like to read about on The Freshman 15? Happy Sunday, friends! As some of you may know (especially if you follow me on social media), last week marked the end of my second Whole 30. 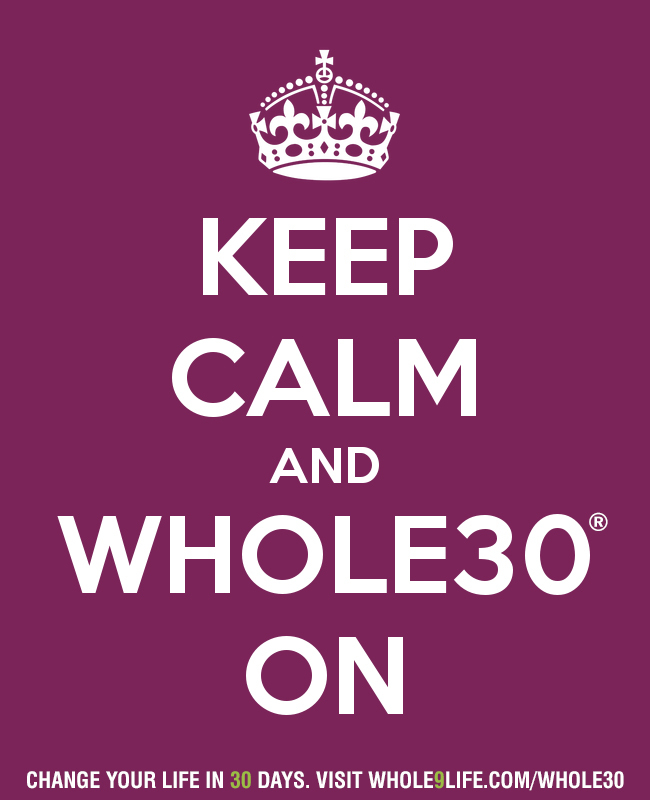 For those unfamiliar with the Whole 30, it is a 30-day program designed to improve your health by eliminating some of the major problem foods: sugar/sweeteners, grains, dairy, legumes and various others. I don’t claim to be an expert in nutrition, and in the past I have avoided discussing my journey to better health on this blog. However, in the past few months since I began experimenting with cleaner eating, I have had dramatic improvements in my skin, energy levels and mood that I never thought possible through diet alone. (I also managed to lose a lot of weight!) Because of my positive experiences with the program, friends have approached me with questions, so I decided to devote an entire Weekend Five to it! When I started really reading the labels on my food, I was amazed at all of the hidden ingredients I found! For example, every jar of pickles in my local grocery store either contained corn syrup, yellow food dye or both. To fulfill my random pickle craving without compromising my diet with unnecessary ingredients, I drove out to a nearby health food store. They tasted just as good as any other pickles, except they wouldn’t make my skin break out the way that food dye does, and they wouldn’t give me a headache the way sugars often do. You’d be shocked at how easily the manufacturers sneak sweeteners into places we wouldn’t expect: sauces, chicken broth, etc. If you aren’t keeping a close eye on what is in your food, then you could be sabotaging your diet in the process! The fewer the ingredients, the better, because it generally means that your food is closer to the original source. 2. Do things the RIGHT way, not the quick way. When I look back at some of the ridiculous ways I tried to lose weight in high school and early in college, I have to laugh. There are a lot of fad diets out there, and we’ve all tested them out. But as much as we like to complicate things, it’s really quite simple: cut out the junk food, eat healthier foods, watch your portions and exercise. Doing it the right way will lead to better habits and weight loss that sticks! Slow and steady wins the race. 3. Find ways to beat the excuses. For the past few years, I wanted to lose weight through cleaner eating, but I always had my excuses: I can’t cook. I’m too busy to prepare meals. When I’m tired, I need my food to be quick to make.However, out of necessity during my Whole 30, I discovered snacks that were easy to make ahead of time, meals that didn’t require much preparation and pre-packaged foods like Lara Bars that were a better alternative to any other “nutrition” bar in the aisle. (Seriously, read the ingredients!) I also learned that washing some fruit or cracking open a hard boiled egg really didn’t add much time to my daily routine, and that my excuses were actually invalid. Figure out your excuses now and then figure out how you are going to beat them in the long run, so that they don’t beat you! 4. Weigh the pros and cons. The next time you are having a craving, ask yourself: “Do I want 30 seconds of gratification, or do I want a lifetime of good health?” The program is only 30 days – to give into temptations early on is to cheat yourself! In the long run, you should allow yourself indulgences every once in a while, but remind yourself that there is a trade-off. Do I miss certain foods? Yes. I have even brought them in as an occasional treat now that my program is over. But I also know that, while delicious, some tempting foods will ultimately make me tired and grumpy, and will make my skin break out. Do I want to eat unlimited amounts of junk food, or do I want glowing skin and a body I’m proud of? The answer to that one is quite simple! 5. There are seven days in the week. Someday isn’t one of them. Readers, have you ever completed the Whole 30 or another clean eating program? What would you suggest to others considering it? What did you learn during the program? Are you considering a program like this? What questions do you have about getting started?